When I started knitting again after a long hiatus, I started hunting for new tools. [I'd picked up a little tool fetish during my time as a quilter.] Certainly there'd be new products to try, right? The first thing I came across were casein needles. And I liked them. But I was still annoyed with the perpetual need to constantly buy pair after pair of needles when I didn't have a certain size in my already embarassingly large collection. I first turned to the well-known Boye Needlemaster, thinking it would solve my problems. But I hate knitting with clinky aluminum needles and found out quickly that I really hated this set. Coarse joins, scratchy surface. Just not for me. I sold my set to someone who likes aluminum and went back to my caseins. Soon after, I spotted an ad for Denise Interchangeable Needles in the back of a knitting magazine. How good could they be? They were half the price of the Needlemaster and I hadn't heard much internet buzz about them. But in the interest of knitting science, I wanted to test them. Yes, that's at least $1000 worth of needles you won't have to buy. And it doesn't even begin to cover the condo needles, stitch holders and other neat tricks it can do. Join various lengths of cord to get just the length you want; leave your work on any cord, twist off the knitting tips and twist on the end buttons and your work is safely held until you need it. Interestingly, I learned that the Denise system was created by the original designers of the Needlemaster. It was their second go at developing the perfect knitting set and it's my opinion that they got it right this time. The tips are made of a smooth lightweight resin that's easy on your hands. The cords are made of a smooth, flexible blue plastic and a simple twist joins the tips to the cords. They do stay put! I found myself knitting more quickly and more comfortably with Denise needles than with any other type of needle I've ever used. Denise needles are so light that I was certain they were even lighter than Addi Turbos. To satisfy my curiosity, I weighed two similar-length circulars -- one 4mm [Addi turbo] and one #6US [Denise]. Both weighed exactly 6 grams. There you go. Science in action. To test this set, I cast on for the Sitcom Chic pattern featured in our last issue. You'll see it calls for quite a few different needle sizes. With the Denise system, I was able to create just about every size called for in the pattern [except the double points]. I knit the body on the longest cord, switching tip sizes when called for in the pattern. And when I started the sleeve, I found I was soon able to switch to a tiny circular made up of two 5.5" cords joined with one connector. Very enjoyable working on these sleeves this way. The joins are not perfectly smooth [they've got a little indent to make it easier to grip them as you twist on the tips], but I found that this took very little getting used to. I knit on the set with pure cotton and cotton/acrylic of all different weights and had no troubles slipping the knitting past the joins. Hint: If you cast on too tightly as I do, you might want to choose the next size larger tip for your cast-on row. Then switch to the size called for when working the second row. The only negative I've experienced is that the smallest tip size [3.5mm or US5] has occasionally come unattached while pushing my stitches over the join, usually on my [too tight] cast-on row. It's because this tip is virtually the same diameter as the join, so slipping snug work from the needle to the cord is a little fiddlier. It's not insurmountable...just be a little more careful when using the smallest size if you're a tight knitter. Customer service note: The original Denise set I received had troublesome cords. My stitches wouldn't slide easily along them and knitting got caught in the joins. It turns out that the Denise folk had a bad batch last fall/winter and I had accidentally received a set of cords from the bad batch. A quick call to Linda at their toll-free number and replacement cords were sent to me with no fuss. As promised, these were very smooth, slippery and worked perfectly. 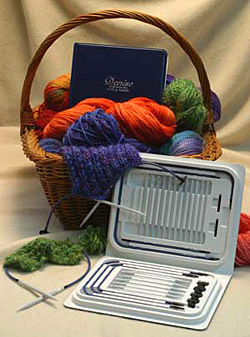 I have never enjoyed working with a knitting product more than with the Denise Interchangeable Needle system. It is unquestionably the best knitting product I've ever encountered in every possible way. Postscript: Long after the original writing of this article, I'm still using the Denise needles on every project I knit. I'm a convert. Amy is a fussy broad and likes her things just so. She's also the editor of this magazine, and hopes you like it just so, too. 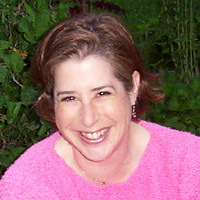 © 2003 Amy R Singer. Contact Amy.